People think of chameleons as the masters of camouflage, but the coleoids – octopuses, squid and cuttlefish – are far ahead in terms of manipulating their appearance. Because their skin appearance system is under neural control, they can change completely in the blink of an eye (50–200 milliseconds) in contrast to the slower endocrine control used by chameleons (which takes one to three seconds). Coleoid skin appearance is a whole organ system, which can vary colours, patterns and even textures across the two-dimensional space of the skin. The skin is packed with chromatophores, pigment-containing cells that are under direct neural control and can expand and contract to produce different patterns of colour on the skin. Under the chromatophores are cells that reflect ambient light, called leucophores, and in some cephalopods, cells that produce changing reflectance and iridescent colours known as iridophores. The fine control of skin appearance is more amazing considering the system’s limitations. Coleoids, having only one photopigment in their eyes, are seemingly colour-blind, so how do they match backgrounds that they can’t discriminate? In the motoneurons of the lobe that controls chromatophores, there seems to be no feedback to the central brain so, again, how do they monitor the patterns they are producing? Fig. 1. Cephalopod's skin is packed with pigment-producing cells which can expand and contract under direct neuromuscular control. Click diagram to enlarge. Cephalopods’ remarkable abilities stem from the complexity of their skin structures (see Fig. 1, above). The outer chromatophores are like the colour pixels on televisions screens, but expansible. Pigment is contained in elastic sacs that are pulled out by muscles, and can go from a barely visible pinpoint to a sprawl of colour – yellow, red or brown/black. When the muscles relax, the sacs shrink to invisibility. Little Metasepia cuttlefish (known as the flamboyant cuttlefish) respond to hassling by expanding specific chromatophore populations in different body areas to produce a pattern of bright yellow and reds on a dark background – the classic poison warning colours used across the animal kingdom. When chromatophore sacs are shrunken, a deeper layer of reflective cells is revealed. Leucophores, found mostly in octopuses and cuttlefish, reflect all wavelengths of light. This means that animals can conceal themselves by matching the colours of the light around them, mostly blue-green in a water depth of more than a few metres. Another set of reflectors in this layer, the iridophores (found in many squid and some octopuses and cuttlefish), are more complex. Instead of pigment, they have reflective properties similar to those of hummingbird feathers. Layers of platelets within the cells, containing a protein called reflectin, bounce only specific wavelengths of light back out. Their colour changes depending on the angle of the viewer, but neurotransmitter release can also change the amount of reflectance and the peak wavelength reflected, varying from red to green. Some courting squid have longitudinal red stripes or green eyebrows, but what use is this if other squid can’t discriminate colours? Perhaps they pick up contrast. These changes may also produce variation in the plane of polarisation of light, which coleoids can discriminate. This is sometimes called a ‘concealed communication channel’ – aimed at conspecifics but concealed from us, and also from fish. Some skin patterns are seen only in localised areas. Eyes are a cue that visual predators use to decide that the object in front of them is an animal. 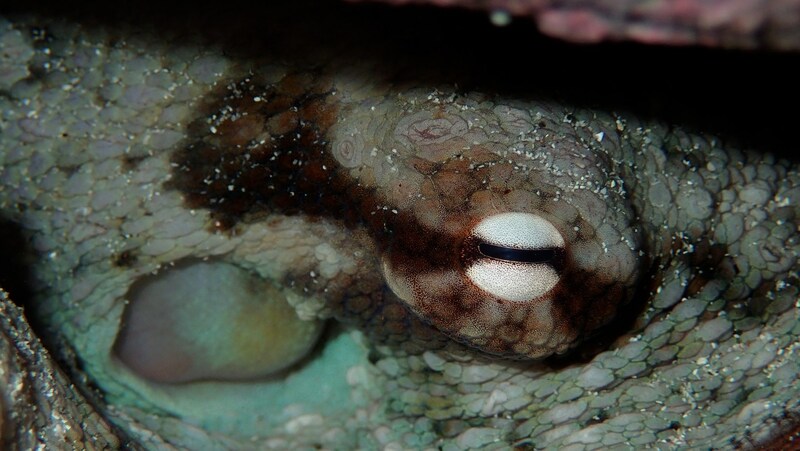 Some octopuses, when aware of an approaching fish or a curious human, can add a streak of darker skin surface at the ends of the horizontal slit pupil to conceal their eye (see image below). Cuttlefish and squid can put ‘fake’ eye dots on the dorsal surface, towards an approaching fish, to look larger and more threatening. Remarkably, cuttlefish know there is no use producing these eye spots to animals such as dogfish, which hunt by tracking chemical cues, and aim them only at bony fishes, which are visual predators. An octopus concealing its eye slit with additional black colouration. Click the image to see a larger version with the individual black and red chromatophores clearly visible. Cuttlefish often rest on the sea bottom and researchers use this behaviour to study their phenomenal ability to match their background. It is believed they use their visual system to analyse what is around them – they have lens eyes and large paired optic lobes. To make a match, cuttlefish can assess the mean intensity of light reflecting off the background, the size of patterns below them and the properties of illumination such as intensity changes at edges. After sensing the pattern they are matching, they quickly choose between uniform colour, disruptive patterns or mottling to match their background. Octopuses react similarly, often appearing to match the colour pattern of the background. Cuttlefish pick up more than just the micro-variations of the patterns behind them. They can also use masquerade, matching the angle of their extended arms to a pattern of stripes in the laboratory or to ribbons of sea grass or branches of gorgonians in the sea. One cuttlefish species can even manipulate arm positions to look like a hermit crab. This kind of imitation has also been described in the octopuses Wunderpus and Thaumoctopus, with black-white stripes on two extended arms causing them to look like a sea snake or all arms trailing to look like a flounder. The assumptions that the cephalopods are trying to mimic other animals comes from divers with imagination, and we need experiments in the laboratory setting to see whether the appearance really deters predators. It is not surprising that such a complex organ system is controlled at several levels. Cephalopods have high-acuity lens eyes, but at the lowest level of control the eyes are bypassed, as there are light-receptive opsins in the skin that can receive the general luminance level without feeding back to the brain. Studies have found that excised octopus skin automatically adjusts to light levels, with the chromatophores expanding in response to higher light intensity. Perhaps this controls basic countershading, mimicking the dark below to avoid being seen from above. These opsins are most sensitive to blue light, which matches the surrounding illumination in the open ocean. Before we knew about opsins, researchers were aware of this reflexive intensity adjustment. Cuttlefish resting colours are darker dorsally than ventrally, which helps them perform countershading: a dark upper surface matches the darker depths of the sea to conceal them from a viewer above, while the lower surface is lighter to hide them from a viewer below. If you simply rotate the cuttlefish, the ventral surface automatically darkens and the dorsal area becomes paler. At a second, less automatic, but still quickly programmed level, cephalopods can camouflage by matching what they see. Their eyes have multiple connections to very large optic lobes. This is where appearance is built – artificial stimulation of these lobes causes the skin to produce whole patterns. Information for appearance production passes through lateral basal and peduncle lobes, both of which have feedback loops to the optic lobe and to the four chromatophore lobes. Axons spread to all the areas of the skin from the motoneurons in these lobes, but there are no feedback loops from them to other areas of the brain. The patterns are produced, refined, organised and sent out, but the final product is not monitored in the brain. If you place a cuff behind the head of a cuttlefish, the skin pattern does not seem to change, so the production is open loop and the animals don’t ‘know’ what they have produced. Brain and behaviour scientist Andrew Packard succinctly described fish and other predators as “the designers of octopus skin”. Perhaps rather than any kind of visual monitoring feedback, the system is shaped by selection: get it wrong and you are dead. A third level of control, not well studied and difficult to evaluate, is at least partly voluntary. Cephalopods are very intelligent. Octopuses use every kind of learning that they have been tested on, they explore and they play, remember where they have been and plan for the future. Anti-predator displays can escalate from camouflage (‘not here, not an animal’) to startle displays like the eye spots (‘really big and threatening’). If one appearance pattern doesn’t work, they switch to another. Change is a good defence, as visual predators form a ‘search image’ and look for visual patterns that they have learned indicate valuable prey. Only if no display deters a potential predator only then does the octopus or squid jet away and produce concealing ink. I learned first-hand about the intelligence behind these concealment strategies when Roland Anderson and I were trying to catch a little sepiolid squid called Euprymna. I had looked at the tiny, bumbling midwater animal and said to him: “That is a cephalopod?” But then we tried to catch it for testing. At our approach, it moved to the water surface, placed its arms in curled positions and darkened, doing a good imitation of drifting seaweed. Still pursued, it went to the bottom, flattened and assumed the mottled pattern that matched the gravel below it. Finally, the squid darkened briefly then quickly became almost transparent, shot out a blob of dark ink and jetted a metre or two away. Like other visual predators, we found ourselves attempting to capture the ink blob while the minimally visible squid was long gone. Colouration is not the only way that cephalopods change their appearance. The skin surface can be smooth or raised in papillae, mimicking the texture of the surface on which they are resting. With such a complex display system, it is not surprising that skin patterns became co-opted by some of the coleoids for communication to conspecifics. Most octopuses do not have visual sexual displays, although Abdopus males produce stripe patterns on their skin, using them as courtship displays to females and aggressive ones to other males. Some cuttlefish species display similarly when both sexes are gathering at the end of their lifespan to reproduce. Males guard females from other males and have visual contests with one another, making the same zebra display but of different intensities, and the ‘winner’ is the one with brighter and more extensive stripes. Some male cuttlefish use a ‘sneaker’ alternate reproductive strategy, where smaller males may take on the same skin pattern as the females and mate with her while a larger male is off guarding against displaying rivals. Some of the loliginid or ‘true’ squid, not living near the substrate and thus not needing pinpoint camouflage, have co-opted the original concealing function for the skin to use in communication with each other. The excellent control of the chromatophores means that squid can have minor and major recognisable units of appearance displayed on different areas of the skin – stripes here, dots there, darker or paler background. Males can even make a sexual display to a female on one side of the body and an aggressive one on the other to a rival male, at the same time[12, 13]. A flamboyant cuttlefish (Metasepia pfefferi) doing the very opposite of blending in. There are so many of these display pieces that most observers have only been able to produce a catalogue of parts, which we assume are made by building small units to combine into larger components, several of which make an organised body pattern. After watching Sepioteuthis Caribbean reef squid and finding such a dazzling array of postures, central major units and peripheral smaller ones, evolutionary biologist Martin Moynihan, with Arcadio Rodaniche, suggested that squid can make a visual ‘language’ on the skin. However, deeper analysis showed that it does not meet classic definitions of what language is. Remember, these courting animals are communicating to colour-insensitive individuals, so it is not surprising that patterns were black and white, and clearly different from one another. We don’t yet understand the contribution of leucophore changes; they may also be communicating shades of meaning with changes in the plane of polarisation of light. This article should make it clear that the appearance system of the coleoid cephalopods is both complex and differently used, and that researchers are only just beginning to understand it. We still don’t know how apparently colour-blind animals make such exquisite colour matches. We can’t imagine how they control and adapt the skin system without feedback about its production. And this account of cephalopod skin has not been able to discuss changes across time, in evolution and development, and the widespread replacement of colour displays by bioluminescent ones in the dark depths. Like the blind men trying to understand the elephant by exploring different parts of it, we have a long way to go before we understand the whole expression of cephalopod appearance and we will need to combine our knowledge to find the central truth. The chameleons of the sea are too complex and fascinating to do otherwise. Jennifer Mather is a professor in the psychology department at the University of Lethbridge, Canada, and an expert in the behaviour of cephalopod molluscs. 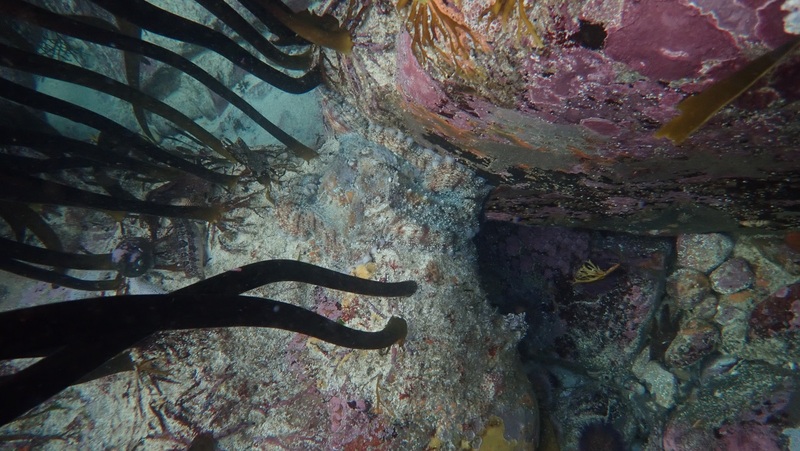 Jennifer and Craig Foster are currently using octopus imagery from the kelp forests of South Africa to test human perception of cephalopod camouflage, and developing underwater tracking methods with Dr Jannes Landschoff to assist with studies of cephalopod behaviour. natural history. Biological Reviews 76, 473–528 (2001). 2) Wardill, T. J. et al. Neural control of tuneable skin iridescence in squid. Proceedings of the Royal Society B: Biological Sciences 279, 4243–4252 (2012). 3) Shashar, N. et al. Polarisation vision in cuttlefish: A concealed communication channel? Journal of Experimental Biology 199, 2077–2084 (1996). 4) Langridge, K. V. et al. Selective signalling by cuttlefish to predators. Current Biology 25, 1195–1200 (2007). 5) Chiao, C-C. et al. 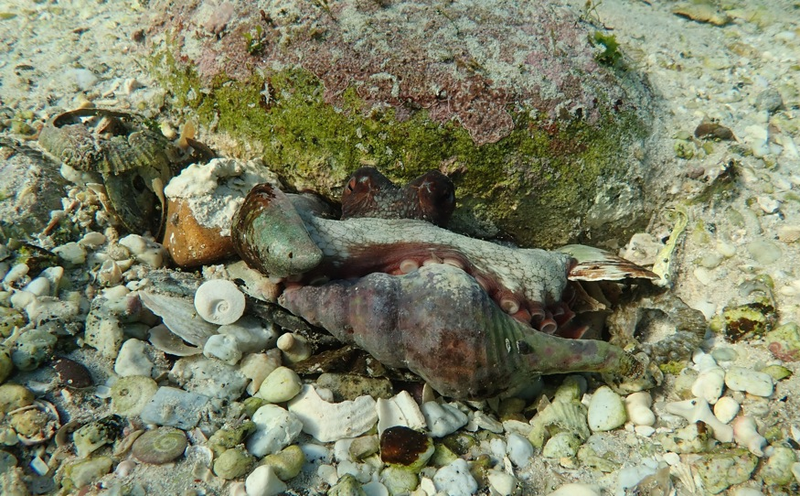 A review of visual perception mechanisms that regulate rapid adaptive camouflage in cuttlefish. Journal of Comparative Physiology A 201(9), 933–945 (2015). 6) Chiao, C-C. et al. Hyperspectral imaging of cuttlefish camouflage indicates good colour matching in the eyes of fish predators. Proceedings of the National Academy of Sciences 108, 9148–9153 (2011). 7) Huffard, C. L. et al. Mating behaviour of Abdopus aculeatus (D’Orbigny, 1834) (Cephalopoda: Octopodidae) in the wild. Marine Biology 154, 353–362 (2008). 9) Packard, A. Cephalopods and fish: The limits of convergence. Biological Reviews 47, 241–307 (1972). 10) Darmaillacq, A-S. et al (Eds). Cephalopod cognition (Cambridge University Press, 2014). 11) Anderson, R. C. & Mather, J. A. Escape responses of Euprymna scolopes Berry 1912 (Cephalopoda: Sepioidea). Journal of Molluscan Studies 62, 543–545 (1996). 12) Mather, J. A. Mating games squid play: Reproductive behaviour and sexual skin displays in Caribbean reef squid Sepioteuthis sepioidea. Marine and Freshwater Behaviour and Physiology 49, 359–373 (2016). 13) Brown, C. et al. It pays to cheat: Tactical deception in a cephalopod social system. Biological Letters 8(5), 729–732 (2012). 14) Mather, J. A. & Alupay, J. An ethogram for octopuses of the family Octopodidae. Journal of Comparative Psychology 130, 109–127 (2016). 15) Mather, J. A. Cephalopod skin displays: from concealment to communication. In Oller, K. & Greibel, U. (Eds). Evolution of Communication Systems, 193–213 (MIT Press, 2004). 16) Hockett, C. F. Animal “languages” and human language. Human Biology 31, 32–39 (1959).